1) Blend all of the ingredients in a blender or food processor until a smooth batter forms. Pour small pancakes onto a greased griddle. Cook until bubbles appear on top, then flip over. 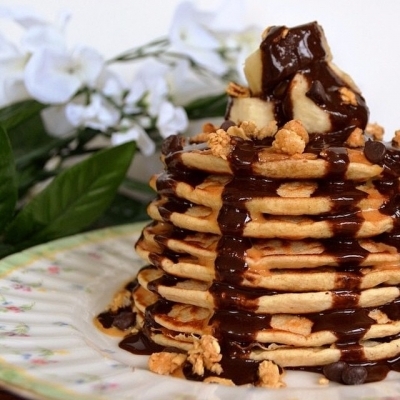 2) Cook like pancakes until all of the batter is gone. Then, go crazy with toppings! 4) These are also delicious on their own, so if you donâ€™t want to add on the extra calories from toppings, theyâ€™ll still be awesome!